ProgressTH: SRI: A Better Way to Grow Rice? 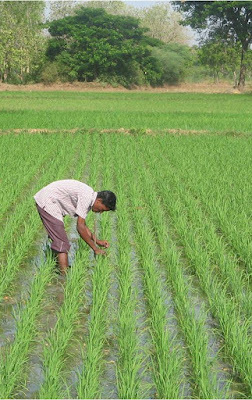 SRI: A Better Way to Grow Rice? March 4, 2016 | ProgressTH Imagine growing two times more rice on the same amount of land, with less fertilizer and less water. Sounds like a dream come true for most farmers. And for some who have tried to do so using a process called SRI (System of Rice Intensification) they claim that dream has come true and in a big way. Originally conceived by Father Henri de Laulanié in Madagascar during the early 1980s, SRI has spread around the world with varying degrees of success. It has reportedly doubled, tripled, and even quadrupled yields while using less inputs. Results vary from region to region and from farm to farm mainly because it is implemented in many different ways. Those promoting SRI have found the greatest obstacle in getting people to adapt this method is entrenched mindsets. Farmers generally have very small margins to experiment and take risks in. SRI is also more labor intensive than many established methods of rice farming. In Thailand, plowing fields, sowing seeds (by just throwing or spraying them), spraying chemical fertilizers and pesticides, and flooding fields isn’t exactly “easy,” but it is a lot easier than planting seedlings by hand in carefully arranged rows, carefully controlling water as one would when growing vegetables, and weeding between the rows regularly with a tiller as required by SRI. And while the process is very labor intensive, we imagine that if more people adapted these methods, more ways to automate or mechanize the process would present themselves. Reduced and controlled water application. Reduced plant density means more nutrients can get into each plant, and more light can reach each plant as well. Regular tilling between rows helps aerate the soil and works weeds into the soil as a form of green compost. In Thailand, several farms have reportedly used SRI successfully. Usually, 1 rai of land produces about 1 ton of rice. Those using SRI have reported anywhere from a modest 1.5 tons to an astonishing 6 tons per rai. However, no two farms have used the same mixture of techniques as seen in the video above. Some use organic fertilizer as prescribed above, while others still use chemicals. Failing to follow one or more of SRI’s basic steps could reduce its efficacy. Improving upon any one of them could possibly improve yields. As we’ve tried out biogas, and will be trying out solar energy, ProgressTH also plans to give organic SRI a try on a small corner of our demonstration farm. Hopefully with careful documentation we can show people just what happens when you use these techniques in Thailand and what results they have.